The adrenal glands are hard to find on ultrasound. They are less than 1 cm thick, and hide in the fat next to the aorta and caudal vena cava. Vet students and lab participants alike struggle to find these tiny organs. What can you use as landmarks? The abdominal vessels are excellent landmarks to finding the adrenal glands. They are relatively fixed in position, and can help to guide you to the right region. The celiac and cranial mesenteric arteries originate from the aorta cranial to the renal arteries, and travel ventrally toward the liver and the small intestine. They form part of the landmark for locating the left and right adrenal glands. Regardless whether you scan in lateral or dorsal recumbency, the left adrenal gland is easier to find. It’s located farther caudally in the abdomen, so is less hidden by the ribs. To find it in either recumbency, I usually get the kidney in sagittal orientation, then move the transducer toward the aorta. If you can get both of these structures in sagittal orientation, the adrenal gland will be between them. Next I locate the celiac and cranial mesenteric arteries. In both scanning positions, they are two vessels coming off the aorta with less than 1 cm between them. 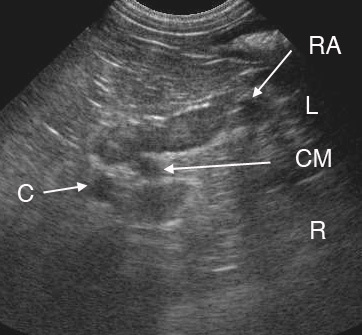 In lateral recumbency they look like cross sections, or two small black hypoechoic circles, and in dorsal can look the same or longitudinally viewed connecting to the aorta. Moving lateral to medial between the kidney and the aorta, I note the renal artery. The left adrenal gland is located caudal to the celiac and cranial mesenteric arteries, and cranial to the left renal artery. In the image, taken in lateral recumbency from the left side, both adrenal glands are visible. The left adrenal gland (L) is peanut shaped and located caudal to the celiac (C) and cranial mesenteric (CM) arteries, which appear as cross sections. It’s also caudal to the left renal artery (RA). The right adrenal gland (R) is also visible, and is located cranial to the celiac and cranial mesenteric arteries. In dorsal recumbency, the difficulty is in recognizing the adrenals from partial volume artifact with the great vessels. The right adrenal gland in particular is close to the caudal vena cava, and can appear to merge with it in dorsal view. Rotating your transducer to a slightly more lateral position, and using the vessels as landmarks can help. When viewed from their respective sides, the right and left adrenal glands can be identified by the phrenicoabdominal vein which crosses at their midpoint (not seen in this image). It usually looks like a cross section similar to the celiac and cranial mesenteric arteries. All of these vascular landmarks can help guide you to the area of the adrenal, and help you to recognize it and orient it in a sagittal view. Once you’ve found part of it, the trick is to rotate the transducer until you can see both the cranial and caudal poles. With the whole adrenal gland in the image, the vessels may no longer be fully visible. I’m curious as to your approach at imaging the right adrenal gland in dorsal recumbency. Do you prefer intercostal or subcostal? I have found that measurements can be variable (+/- 2-3mm) even at the caudal pole depending on the angle of the gland vs. the left side when imaging the right side subcostally. Douglass JP, Berry CR, James S. Ultrasonographic adrenal gland measurements in dogs without evidence of adrenal disease. 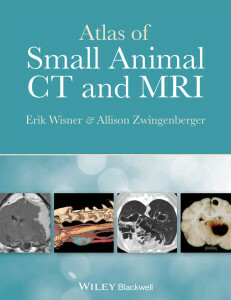 Veterinary Radiology & Ultrasound 1997;38:124-130.